Forbes It is a great treat to talk to Scarlett Johansson and Pete Yorn together. What’s so refreshing about it is in this age of too many forced music partnerships and features for commercial sales sake, the two of them genuinely like each other, as evidenced by the way they talk to each other, share inside jokes, laugh often and reminisce as real friends do. Their reasoning for reuniting to work together on the superb new EP, Apart, nine years after they teamed for their collaborative album, Break Up, is simple and pure. They missed working together. That comes across in both the music, which ranges from the fun of the opening track “Iguana Bird” to the more ethereal “Movies,” and especially the conversation. In this joyful and engaging chat between the two close friends and musical partners they discuss parenthood, pizza, time flying by and Disney. Steve Baltin: It’s been nine years since you did an album together. So much has changed for you both in that time. Talk about the different things you both brought to collaborating this time. 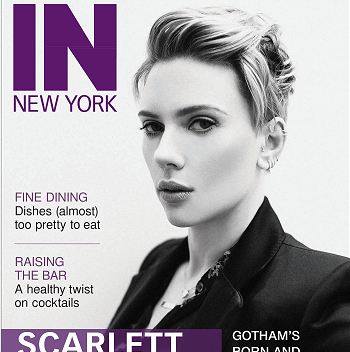 Scarlett Johansson: We’re parents now, which is I think the biggest life change that can happen for anyone. It gives you a different perspective on the passing of time. The two of us just hanging out and talking, coming from a place that’s of the life experiences we have, I think you can hopefully hear it in the sound. And it feels like, in some ways, picking up where you left off. But then there’s also a sense of there’s been a passing of time and some progression and that sort of sticky nostalgic place you can sometimes regress back into later in your life. Pete Yorn: The whole reason we got back together, from my end, was I just missed singing with Scarlett. It felt like too much time had gone by and I felt super nostalgic for those 2006, 2007 days. And I needed to do it again and I was so happy she was game. She was definitely a baby when we did the last one and I was a little bit older than a baby. But it was quite some time ago. We both have daughters now and it changes your perspective. It’s funny though, people always ask me, “How has it changed the way you approach music or your songs?” And I always thought, “Would I write my, ‘I believe the children are the future?’” And I still write kind of moody songs, so it hasn’t really changed my writing too much. Baltin: You may never write “The Greatest Love Of All,” but often times there are subtle things that you pick up on later. So maybe it’s influenced your writing and certainly your lifestyle in ways that aren’t overt. Yorn: On a practical level, just having a little one makes my time more focused on different things. I’m so hands on with my little girl, I wonder before my kid what the hell did I do with all my time. I think that manifested in picking up my guitar here and there, banging out a song, and now I gotta be much more structured about it if I want to get stuff done. Scarlett can speak for her experience there, but she is even more busy than I am. Johansson: Personally speaking, your creative time becomes more valuable. I find responsibility of having a child and balancing life as a working mother a welcome challenge. I think it somehow pares away a lot of the noise and it’s sharpened my artistic focus. So I work on projects that are meaningful to me and I feel very dedicated to having a satisfying experience and seeking out the interesting, often times ugly, unturned stones. I like to dig that stuff up because my work time is valuable. If I’m going to not be spending time focusing on being completely hands on with my daughter, which I am, then I want to make sure what I’m doing is really meaningful to me. And this project is definitely a reflection of that. It was a chance to return to something, revisit something with a new perspective. And I think that’s an unusual opportunity to do something like that. Also having a partner you’ve known for almost 15 years, it’s a rare thing. Click here to rest the Rest!